Alstroemeria flower will capture and delight your eyes. The Alstromeria’s array of colors are come in yellow, lavender, purple, pink, red, white and orange. All with the beautiful contrast of leafy green. Alstroemeria flowers are delightful to behold and can spruce up your wedding surroundings. Perfect for decorating at corporate events, dinner tables, bouquets or centerpieces too. Add Alstroemeria flowers to your floral arrangements, as focal or filler flower on your next special occasions. Alstromeria are perfect for making small centerpieces, bouquets or other floral designs. Alstromeria flowers are also budget friendly with a higher end looking flower. Therefore, the exquisite colors of Alstroemeria flowers are certainly a must have for any occasion. 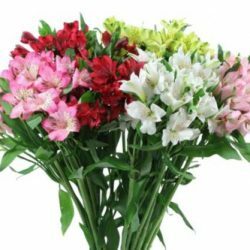 Buy Alstroemeria bulk flowers online for weddings and special occasions.